JJ Performance NHRA Accepted Engine Diapers are an approved Oil Containment Diaper and approved for all Sportsman Classes except TAF and TAD. This engine diaper will fit a 6-10 quart oil pan and comes with a replaceable absorbent pad and includes all mounting hardware. 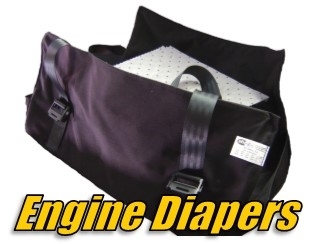 ** If your engine diaper will in anyway come in contact with the headers or exhaust system we recommend you upgrade to our Kevlar® Engine Diapers which are fire resistant and can withstand high exhaust temperatures.